I like hair spray now and then. Usually when I need to be certain my hair will stay in place - whether up or down. There are times when being distracted by your hair is unprofessional, too cutesy, or less classy than you want to appear. Or just plain maddening. But we are warned that hairspray has alcohol and alcohol is bad for hair, right? Or can we work around it? I have used Aqua Net unscented since my days as a professional dancer when hair had to stay in place during costume changes and much spinning and jumping. Hairspray works by what is known in the cosmetics industry as "spot welding;" junctions of 2 or many more hairs is stuck together with hairspray and this holds the entire style in place. The hair does not need to be saturated as with gel - just misted lightly as though you threw an invisible net over your hair. 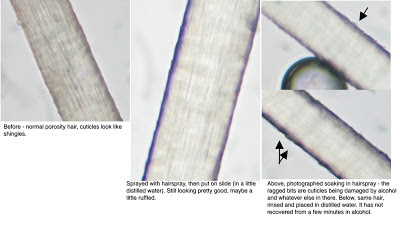 Recently I tested hair treated with hairspray (containing alcohol) under a microscope. 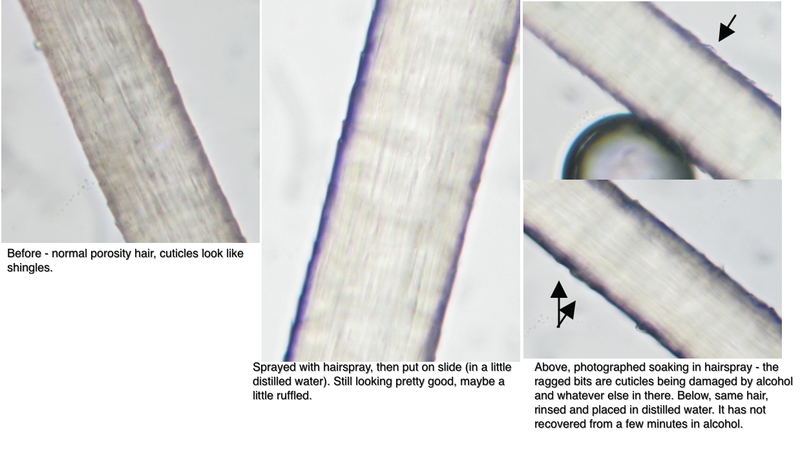 Because I get the best images with items placed in a liquid, I left the hair in the hairspray. That was a mistake. (Click the photo for a larger image). Let me reassure you that picture at right (above) is not the fate of your hair if you use hairspray properly. Read on. Hairs left to soak in alcohol-containing hairspray began to deteriorate rapidly by 1 minute. So why do we think this is bad for hair? I have seen people whose hair looks damaged who use hairspray - but is the hairspray to be blamed exclusively? I believe the answer is not entirely in the dehydration of alcohol from hair - a process which could pull water from hair in the process. Alcohol is very effective at removing oils and anything oil-like from hair and skin. This is a major down-side of alcohol in any cosmetic formula. Alcohol is also a solvent which does cause hair to swell, so if hair is too well-cleaned and not protected by emollients (silicones, oils, some conditioning ingredients) in the hairspray or oils from the scalp or conditioners or hair gels, it is especially vulnerable. Lack of a protective emollient coating allows alcohol to contact the hair and the alcohol may damage what little emollient is there. Any time hair swells, there is stress to the hair shaft as a whole. This condition would also encourage dehydration of hair, dullness and loss of elasticity. I think the problem is that people often over-use or mis-use hairspray in conjunction with other hair-damaging practices (high-heat tools, teasing/back-combing hair, ordinary brushing, bleaching permanent coloring). But especially hazardous is using too much hairspray in one place, or using it every day! Hairspray needs to be completely dry within 30-45 seconds or it may cause damage. That means your hair should not be well-wetted with hairspray. Thus instructions say, "hold 6-8 inches from hair and spray." The key seems to be to use hairspray sparingly so it does not take much time to dry and to include emollients in the formula (or on the hair as oils or conditioners) to protect the hair by forming a barrier to the alcohol. Those emollients also reduce the shellac feeling of hairspray. I think as long as we use hairspray as an "invisible mist-net" to occasionally finish off a style and avoid saturating the hair with it, our hair can remain dazzlingly healthy - and glamorous. When I used to walk into the high-school ladies room in a cloud of hairspray and 4-6 inch tall bangs/fringe - that was so very wrong. Thank you so very much for the work you're doing with this blog! I was seeking some reasonable information on hair matters for ages and I'm so greatful I've came along your blog. To the topic of alcohol in hair products: it is widely used in lotions and treatments for hair - for scalp mostly, but for length as well (products like thickening serums for fine hair, mists, light oils emulsions and so). These products suggest application of an amounts more generous as with sprays - scalp treatments definitely can soak hair strands close to the roots. What do you think about benefits vs damages from such products? Thank you! If you're seeing SD Alcohol 40, Ethanol, SD Alcohol, Propyl alcohol, Isopropyl alcohol, Alcohol denat. or Propanol - those are alcohols that can be drying to hair when they're near the top of the ingredient list, like in hairsprays. When you see Cetyl alcohol, Cetearyl alcohol, Stearyl alcohol, (as examples) - those are "fatty alcohols" and are not drying to hair. They are alcohol in chemical structure, but they're not drying liquids. They are creamy thickeners and help hair and skin feel soft. Sometimes Isopropyl alcohol is near the end of the ingredient list for a product - in which case it's probably being used to help a fragrance or other ingredient dissolve and there isn't enough to worry about. There are some conditioners and styling products that use ethanol or Alcohol denat. as a co-preservative, in which case it will be closer to the top of the ingredient list (first 5 or 6 ingredients). That won't necessarily be drying because hair is also surrounded by conditioners and oils. Aubrey Organics is one brand whose conditioners sometimes contain alcohol to preserve. But some of those formulas are very popular, so it's working well. Thank you for explaining the difference between alcohols and fatty alcohols! In my question I mean regular alcohols, which I often find in top positions of the ingredient list. All three have alcohol denat as a second ingredient right after water. I wonder if such formulas make more harm than benefit. For products that you're putting on your scalp, you want to use as little as possible so the product dries quickly and does not saturate your hair. If there are oils or other emollients in the product, or your hair, that can act as a bit of a buffer for the hair. If you have products in your hair already, a product like a oil spray with alcohol is less likely to be a problem - less direct contact with your hair. But otherwise, the net effect of alcohol + oil is hard to predict. If you're worried about alcohol in a product, better not to use it. Davines makes a gel for scalp treatment that is alcohol-free. Other caffeine-containing products - serums, conditioners are also alcohol free in place of the other Davine's product. I would probably look around for another product.